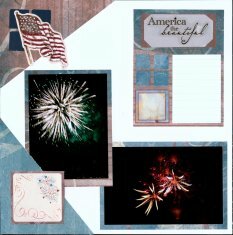 From time to time we want to celebrate our country with Patriotic Scrapbook Layouts. We celebrate Independence Day in the United States on the 4th of July with Fireworks and other local family gatherings. 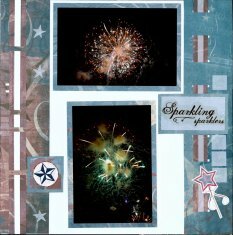 These Patriotic Layouts of the 4th of July Fireworks were made from page Embellishments made with paper, stickers, die cuts and techniques from a Creative Memories class called "4th of July Technique" at the Scrap Book Expo in Atlanta, Ga.
We made all the embellishments for these July 4th Layouts in a class and then later I placed them on the pages along with the photos. I had planned to use some of my Fireworks photos for these, but any photos from the 4th celebrations would work. This was a good idea to make just the embellishments. It made final assembly of the layouts much faster and easier, since all the detail work was already done. You can always make embellishments for particular planned pages when you only have small sections of time to scrapbook. Check out our Tutorial on Tips and Tricks to go to Great Fireworks Photos. 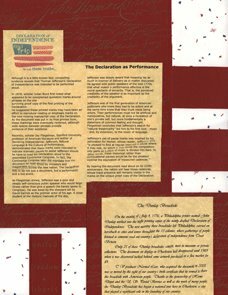 These Patriotic Scrapbook Layouts below, came about on September 11, 2002, while the Broadside for the Declaration of Independence was traveling around the county and managed to make it's way to the Charleston, SC area. These papers and all embellishments were from the Club Scrap, Special Edition Kit, Freedom that was delivered to my door on September 11, 2002! It was there, just as I arrived home from taking these pictures and getting to see the actual printed copy of the Declaration of Independence. The Stars and the Red. White & Blue lettering were purchased at my local scrapbook store. 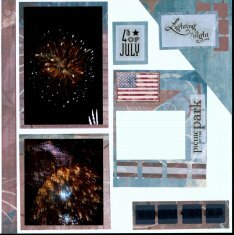 The star in the upper left intermingled with the flag image, was from a wood mounted rubber stamp included in the kit. 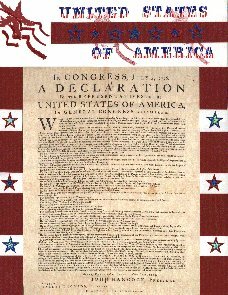 Also included was the parchment paper of the Declaration on the left page. 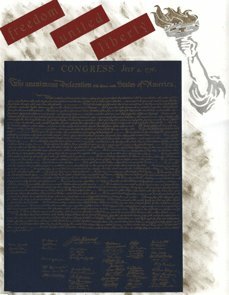 The right hand page contains journaling from the movie shown at the viewing of the document as well as information about the owner of the Broadside, how he came to own it and why is was traveling the country. What an honor to be able to see something printed in 1776! 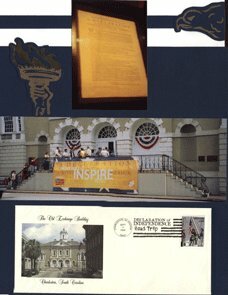 Here is another sheet from the Freedom Kit from Club Scrap, the dark blue with the Declaration image in Gold. Unfortunately it doesn't show well in the photo, but it is stunning in real life. The three red tags were pre-printed with Freedom, United and Liberty in the Gold. The image of the Statue of Liberty Torch was from a stencil. I used gold and silver metallics to image the torch and in various other places on the pages. The right page also mirrors that Liberty Torch with a blue and gold cut out as well as an blue and gold eagle cut out. 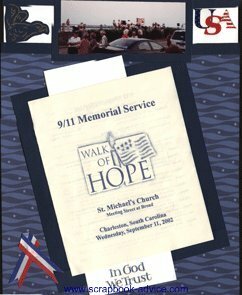 This visit of the copy of the Declaration, also coinsided with the first anniversary of 9-11 and other photos from that day also include brochures from two memorial services held in honor of the victims of 9-11. 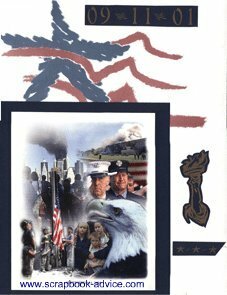 For these layouts, I had a blue and gold cutout 9-11-2001 and another Eagle & Liberty Torch cutout. 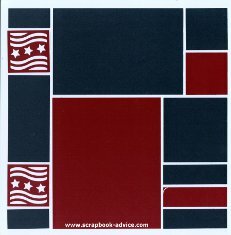 The image of the Star and Flag on the White paper was the same image as the rubber stamp in the first pages only larger and in Red and Blue. 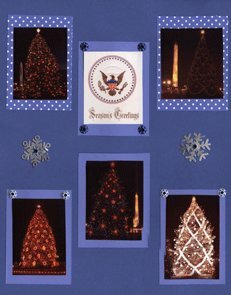 More Patriotic Scrapbook Layouts using some photos of our National Christmas Trees over the years. 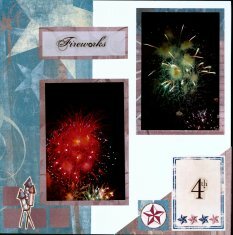 They were all arranged on a dark blue background cardstock with assorted photo mattes of blue with white stars and dots. 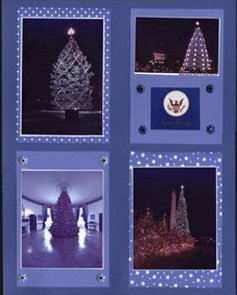 I also used a couple of photos of the Presidential Seal instead of journaling to indicate that these were our National Christmas Trees. Eyelets were also used to attach the Presidential Seal as well as two large silver metal snowflakes. 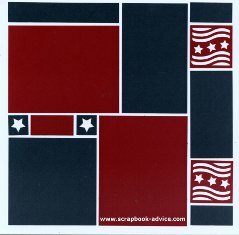 Check out the Washington DC Scrapbook layouts for more Patriotic ideas.